Guess what? Another bug has been found in Myki. You know how you can load a Pass (weekly, month, yearly etc) onto your Myki, and use it, and load a second Pass which won’t activate until the first one has finished? Well there’s a bug which sometimes causes the second one to activate before the first has finished. I know this, because my new Yearly activated 13 days before the old one had finished, leaving me with two active Yearly Passes. So far PTV is saying three people have contacted them about it. I did… at least one person reported it on Whirlpool, and possibly even a second — surely that couldn’t be the only three people it has affected? Or are there more people who haven’t yet noticed? It’s unclear if this happens to everyone who (quite legitimately) loads two Passes onto one card. What is particularly surprising is that this is a part of Myki that has worked flawlessly since I’ve been using Passes on it in 2010. For something so fundamental to go wrong smacks of a new software version being rolled-out without having been fully tested. If you use Myki Pass, now would be a good time to check your transaction records and the card status and make sure it’s doing what it should be doing. We are writing to provide you with some important information about a matter that has affected some of your Commuter Club customers. As you are aware, when a Commuter Club customer renews their annual myki pass for another year, we add that second pass to a myki a few weeks before the current pass expires, so it is ready to use straight away. 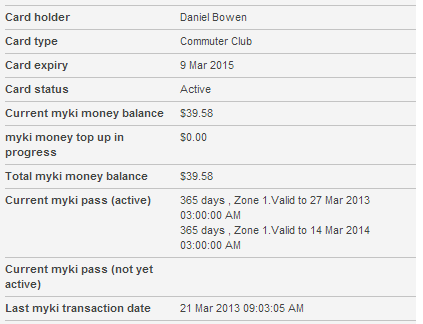 For a small number of customers, the second myki pass loaded to their myki, started before the first had expired. We are contacting those affected customers to make them aware of the situation and advise that a reimbursement for the number of days the pass activated before it should have is being refunded to them via cheque. Please be advised this matter has been corrected. 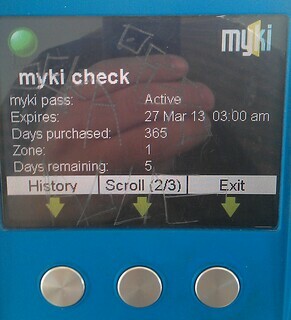 Our records indicate that the second pass loaded to your myki card [removed] started before the first had expired. Our investigations confirm that your second myki pass activated while you had 13 days remaining on your first pass and as such a cheque reimbursement of $70.00 will be mailed to you within the next 10 business days. $70 is enough to buy 2 x 7 day Zone 1 Passes ($35 each), making up the 13 days lost plus one. However, given the current Yearly Pass I’m on expires next year, after next January’s price rise, it may not cover those 13 days. At least some others affected are getting their refund as Myki Money loaded onto the card instead of a cheque. It’s still unclear how many people have been affected, and whether they have proactively sought them out, rather than just waiting for complaints to come in. After considering the details of your special consideration claim, a reimbursement has been granted and an amount of $ 35.00 will be posted to you as a cheque within the next 10 days. Ummmm.. Hmm. Better get in contact, I suspect. Update 29/4/2013: A follow up email acknowledged that the one quoting $35 was wrong, and said I’d get a cheque for the full amount (eg $70). Then a cheque arrived for $35. It was mailed before the last email though. Update 2/5/2013: They’ve acknowledged the error and are sending out a second cheque for $35, making a total of $70. ← Previous Previous post: Why are #MetroTrains cancellations rising? Is it because the government skimps on signalling? 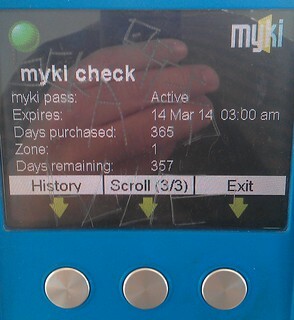 So hard to tell where the fooling begins and where it ends with MYKI today! Assuming this one is real (as it would be a pretty lame April fool in all honesty). The test of whether MYKI are serious about themselves is how they handle these situations. I personally do not think it is reasonable to expect the system to be flawless, however I do expect that MYKI will take quick and serious action to correct issues when they are identified. Their current track record for how to deal with customer issues is to raise their hands in the air and shrug their shoulders. Since they are the ONLY game in town they could leave it at that, what’s the alternative after all? However I would hope that they would see that they could do so much more and turn mistakes into opportunities to demonstrate their initiative and commitment to providing a ticket system for the future. So whilst they are stumbling right now, they can either fall or get on their feet and stand tall. I would hope that they would choose the latter. Melbourne deserves a good PT system as much as it needs one. It’s a scam. They are trying to discredit you. What are the odds, that of the 1.2 million myki users in Melbourne, you are one of the only three affected ? Good to see they’ve attempted a refund. What they should be able to do is modify the expiry date of your incorrectly activated pass by adding on 13 days. Obviously security measures need to be in place so this feature cannot be abused or hacked into.